Summary: An Inuit girl named Pani longs to be a great polar bear hunter. When she shares her dream with her friends, however, they mock her and insist only men can be great hunters. Hurt by their jeers, Pani walks far away on the polar ice where she encounters a wounded polar bear cub. Rather than kill the cub, she decides to heal it, learning in the process what it really means to be a great hunter. Conduct an Artifact Study by showing students four objects (e.g. fish, lure, plush polar bear, ice cubes) and asking them to suggest ways in which the objects may be connected to the story. Where might this story take place? 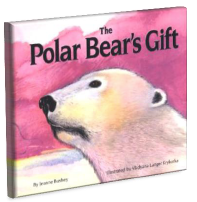 What do you think may be the gift that the polar bear possesses? Is this a fiction or non-fiction book? This is a fiction book. This is a special kind of story. It is called a legend. What kind of story is a legend? A story orally passed down through generations. The story is usually about a cultural group and often includes supernatural powers. What are the objects in the story that make this an Inuit legend? Objects include the sled, igloo, the language spoken, the soapstone carving, the polar bears and the magic patches of fur. Why is it said in the story that only men are great hunters? Hunting is a traditional role of men. How did Pani use her WITS when she was teased? Pani walked away from the situation. Why did Pani change her mind about killing the polar bear and instead helped it survive? What did Pani discover about great hunters? Great hunters respect life and have compassion too. Draw two columns on a large piece of chart paper. At the top of the first column print “Gifts in the Story.” Brainstorm with students gifts given in the story that were not objects. At the top of the second column print “Gifts that We Give One Another.” Brainstorm gifts that the students give to others that are not objects. Ask students to write on a piece of paper positive character traits that describe themselves. Students should then choose three traits they think describe how others see them. Have students draw a sketch of themselves and then write these three traits on the sketch. The sketches can be posted on a bulletin board without including students’ names and the class can then guess who is described.